A Royal Navy nuclear-armed submarine sits in the dock at its Scottish base in 2006. Foreign minister says "time right to be open about the weapons we hold"
London, England (CNN) -- Britain has a total nuclear arsenal of fewer than 225 weapons, with 160 currently operational, Foreign Secretary William Hague said Wednesday. "We believe that the time is now right to be more open about the weapons we hold," Hague said in a statement to Parliament. "We judge that this will assist in building a climate of trust between nuclear and non-nuclear weapons states and contribute, therefore, to future efforts to reduce the number of nuclear weapons worldwide." The British disclosure follows similar recent announcements by France and the United States, the other nuclear-armed Western allies. 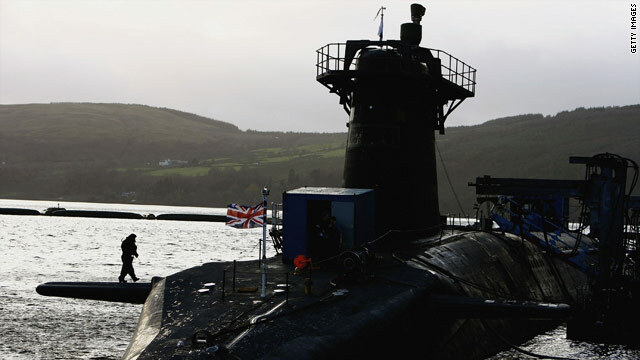 Britain had previously disclosed that it had 160 operational warheads, which since 1998 have been based aboard a squadron of four ballistic missile submarines. In May, the United States announced its stockpile of nuclear weapons numbers 5,113. In April, Washington decided to swear off the development of new generations of nuclear weapons and announced it would not use its existing warheads to attack non-nuclear states that are in compliance with nonproliferation agreements. The same month, it signed a new pact with Russia -- its leading rival in the Cold War arms race -- to cut each nation's stockpile by about a third. France reported an arsenal of about 300 nuclear weapons in 2008. Three other countries -- China, India, Pakistan -- are known to have nuclear weapons. Israel is widely suspected to have developed the bomb, but has never declared itself a nuclear power. North Korea says it has produced plutonium with "weapons potential" and claims to have conducted nuclear tests. But the Federation of American Scientists says there is no publicly available evidence that North Korea has operationalized its nuclear weapons capability. Libya and South Africa have dismantled nuclear weapons programs under international supervision in the past two decades.